Are Your Dental Customers Feeling Your Appreciation? The thing about great service is that it stands right up there and slaps you in the face. You see, great service is so uncommon, so not ever there, that when it is there, it is really difficult to miss it. I’m writing this blog while I’m on my way home from an intense two-day Mastermind meeting in Atlanta. And as you can imagine, when you travel halfway around the world, after I’ve been on the ground in Atlanta for less than forty-eight hours, I’m feeling a little bit topsy turvy, and I’m not sure if I’m Arthur or Martha. But what I am sure about is the excellent service I just received on the first part of my journey home. I’m writing this piece right now from my seat aboard QF8. My plane has just now departed from Dallas-Fort Worth airport and is up in the sky headed for Sydney. But, and I mean BUT, my earlier connection from Atlanta to Dallas was a little bit “iffy”, if you know what I mean. The reason I say this is that last month on my trip home to Sydney from Philadelphia, as you all know, my airline flight connection in San Francisco was tight, and due to weather, I missed my Qantas flight home. So with that recent episode in mind, I was mindful this time that my travel agent had booked me today on a flight from Atlanta to Dallas which had given me only seventeen minutes on the ground in Dallas Airport to connect from my landed flight [from Atlanta] to my departing flight [headed to Sydney]. And to me that was never going to be enough time…. You see, you never ever know which gate or terminal your flight is going to arrive at in Dallas, and so there is the anticipation of the fact that you could spend a heck of a lot of your valuable time in Dallas airport just running around from gate to sky train to gate…. if you know what I mean. With luck, my meeting in Atlanta finished mid-afternoon, so I had the opportunity of getting to the Atlanta airport earlier. And with this, I was fortunate to be able to ask if there was availability to travel on an earlier flight from Atlanta to Dallas. So, in Atlanta, there’s a great Sushi restaurant in terminal C. And my flight was leaving from Terminal T and check in was in Terminal T…. So here’s what I did. I headed out to Terminal C for the Sushi, figuring that my chance of a bump forward was slim…. So fast forward now, and although I had plenty of time, my Sushi meal was slow being served, so I ended up heading towards my Gate in Terminal T on the late side. In fact, I ended up arriving at my gate about ten minutes after boarding had commenced. So I ask there whether or not I’d been able to get the bump forward. I’m greeted by the gate attendant at the counter as though I’m a long lost relative! She has my boarding pass there waiting, and they’ve been holding my seat and calling for me for a heck of a long time she said…. And all of this was conveyed to me with excitement as if it had not been a bother and they were so glad to have found me…. So, long story short, I board my plane, I’m seated in the correct cabin, and I enjoy some super service on my flight across to Dallas from Atlanta. When I arrive in Dallas I have plenty of time to travel from gate to gate via sky train, and all is good in the world. Was I made to feel special? Was it because of my flying status with One World? The thing I do like about American Airlines is that they do go out of their way to recognise their loyal customers. What are you doing in your business to make your long term loyal customers feel special? You see, while I was waiting to board my Qantas plane, I chatted with a fellow traveler who told me he would be switching from Qantas next time…. Now I’m not sure exactly why he was switching, but I do know, that when I do fly Qantas, and American, they do go out of their way to smooth over any hiccups that invariably occur. Is that because I’m a premium flyer? I think that loyalty to a brand should count for something, don’t you? How loyal a customer are you? Are your regular suppliers rewarding you for your loyalty? After all, we are all human…. How can we apply this to dental? Do you know who your loyal customers are in your dental practice? And are you recognizing those loyal customers for all of that loyalty? Are you taking time to repeatedly make them feel special? Or are you just brushing them off while you go through the motions of your day? Interestingly on this trip, because of its shortness of duration [it was only two days really], I shared my return flight home from Dallas with the exact same crew that had flown me out of Sydney into Dallas. And boy were they attentive to me on both flights. It is nice to know that employees value their loyal customers, and take nothing for granted. Customers recognise when this happens, but customers also recognise when they don’t feel appreciated. Are your team members ensuring that your customers of your dental practice are feeling appreciated? In 1996 I was at a crossroads. I’d been a dentist for 14 years, but I was becoming frustrated and confused. I was looking to sell my moderately successful dental practice and try some business outside of dentistry. My practice was collecting well, but I wasn’t anywhere near to full capacity in terms of time and patients. And I couldn’t work out why it was this way. In 1996 I tried to sell my dental practice, but nobody wanted to buy it from me. In fact, three dentists who looked at my practice for sale in 1996 decided not to buy my practice, but to set up as my competition nearby to my dental practice, right there in my suburb. In desperation, I looked at the option of buying another dental practice, and working the two practices concurrently over a six-day week. How does that model sound? It sounded like a good idea to me. All of a sudden I would be twice as busy. But I would also be working with twice the overhead. Twice the rent. Twice the salaries. The list goes on…. Would you purchase a second location and run back and forwards between the two? Fortunately for me I did not…. I was keen to do so. Don’t get me wrong…. And I would have purchased the second practice except for the fact that it was sub-letting its rooms inside a medical practice, and so there was no guarantee of longevity of tenure with that current location. In the end, I declined the option of buying that second dental practice. Instead, I chose to knuckle down at my original location. I restructured my personnel, and moved on those who were holding back the practice growth. I added extra front office and back office staff. I added a hygiene department. And eleven years on, I sold that dental practice for what turned out to be a 10X multiple of the asking price that I had sought originally in 1996. Did I make the correct decision? What if I’d have bought that other dental practice and been able to double its production, in the same way that I was able to increase the production at my own dental practice? What if I’d been able to employ some high achieving associates who were able to grow their own associateships, and who then would have bought into the organisation? What is for sure and certain is that an increase in the number of locations would also result in an increase in the number of challenges needed to be overcome. 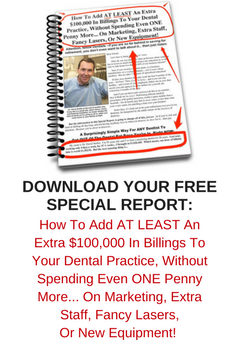 Dental practices are very profitable. We know this. Otherwise our industry would not be in the grasps of corporate takeovers, as we speak. There are large profit margins in dentistry compared to other types of bricks and mortar businesses. In dentistry I am continually meeting owners of dental offices who are not dentists, who own practices that are generating considerable profit. Some of these non-dentist owners own more than one dental office. Could I have done that? It certainly was not a model that was on my radar back in 1996. In 1996 all I was concerned about was making sure that I myself was as productive as possible as a dentist, and that I was able to surround myself with the right people that allowed me to practice dentistry this way. And that’s what influenced the model of the dental office that I ended up with. What sort of dental operation would you like to operate? Life is all about choices…. Can You Turn A Bad Story Into A Great Customer Experience? When things go wrong in your business it’s best to come clean with your customers. It’s pointless trying to lie, or fabricate an excuse because more often than not, the truth will reveal itself, with dire consequences. If you make an excuse, and it’s a feeble excuse, you will find yourself more often than not in a hole trying to dig yourself out, instead of taking a bullet [for the causes] and then soldiering on. Your customers will respect you for your honesty. Your customers will not respect you for any deceit. Last week I had to fly from Sydney to Dallas with Qantas and then on to Atlanta with American Airlines. Fast forward and my flight is over ninety minutes late departing. And I have a very tight connection in Dallas for my next flight. When I finally get seated on my Qantas plane the Captain announces to us that routine maintenance had taken longer than expected and that we will catch up the time in the air…. I’m doubtful but I’ll put my faith in the Lord…. The Captain also tells us that there is nothing wrong with the plane. My thought is then that if it is indeed a routine maintenance event for this aircraft, then why the heck has it taken so much longer? And why the heck have paying customers been inconvenienced because of this “routine maintenance”? The thing is, when I was sold my ticket, I questioned the tight connection. My travel agent, who was not working with Qantas, assured me all would be OK. When it was announced at the airport that my flight was delayed I went straight to the counter in my lounge and asked to be rebooked in the USA on a later connecting flight, but was assured that Qantas and QF7 would be able to make up the time during the flight and all would be OK. Even then, while on board my Qantas flight, I was assured by my Chief Steward that ground staff at Dallas would ensure that I would make my next American Airlines flight, despite the “tightness” of the connection. I waited to see this…. Although it was with another airline, a friend of mine was recently turned away at a gate, while his plane was still boarding, because his connecting flight [from the same airline] had arrived slightly late, and the airline had cancelled his ongoing ticket and onsold it. Despite the fact that he was still able to arrive at the said gate, and the plane that he was originally booked upon was still boarding. Despite all this, my friend was rebooked, by that airline, onto a later flight. And yet his luggage was connected on the earlier designated flight. How could that all be? My second hesitation was because only three weeks prior to this trip, I had raced through San Francisco airport trying to connect up with a Qantas flight after my American Airlines flight was delayed because of weather. And despite the fact that there were fourteen passengers on my American flight trying to connect with that QANTAS flight, and despite the fact that while running thru the airport I could see the Qantas plane, the darned thing left without us all and we all fourteen had to spend a night in San Francisco because of this…. And on the next night, while on the Qantas flight before departure, it was announced that we were waiting on five connecting passengers. None of those passengers made that flight…..
Can you imagine my skepticism? So what exactly ended up happening? Well, before my Qantas flight landed in Dallas, the head steward had been to see me to let me know that I would certainly miss my connection. But, he had good news. Qantas had secured me a seat on a later flight from Dallas to Atlanta, and I would not be needing to rush my way through arrival and then back through security. And then it got even better…. As I was de-planing my Qantas flight, my head steward handed me my boarding pass for my new ongoing flight into Atlanta. Now to me that was something special. And it was re-emphasised to me as I walked through the Dallas airport towards immigration and Customs and saw probably thirty or more boarding passes lined up on a window ledge for those of my fellow travelers who were in a similar situation to me. It was then that I really felt valued, as a loyal customer of Qantas. This was a great service recovery story. Your business’s Service Recovery Process is the ability of your team to make things right following a service defect in such a way that the process of recovery is indeed a more wonderful experience than if your business had gotten things right in the first place. And this is what Qantas did this time. How are your Service Recovery Processes in your Dental Office? Are your Service Recovery Processes amazing your dental patients and customers? You know they should be. Are you working to ensure all your Service Recovery Processes are indeed World Class? What Is Your Professional Purpose? What is your purpose in being in business? Is it to be the best you can be at your chosen profession? Is it to be recognised by your peers, and by your customers as a leader in your field? Is that your goal of being in business? Is that your only goal? Or is your goal in business to create an income that allows you to do other things rather than work? Imagine that…. your business creates an income stream that allows you other benefits. Helping you to help others who need help. I was talking with a client this week about a dentist they know whose family relationships have now disintegrated to divorce because of the dentist’s focus on her business at the expense of spending time with her family. I believe that life is all about planning, and priorities. Firstly, without a plan, and I mean a business plan and a family plan, the chances are that you’ll end up exactly where you deserve to be … and that’s NOWHERE! So what’s your family plan? What are your desired amounts of times to be spent with your family? What are your desired vacation times and destinations that you would like to take with your family? What are your preferred educations for your children? Secondly, what other time outs do you need away from your business? Do you have spiritual or social goals that require your time or your financial contribution? What hobbies do you have that could require time? Is it possible to design a life and then engineer your business to allow you to fulfil your life plan? Do you have a clear vision of what your family and your life is going to look like in five, ten, twenty or thirty years time? Or are you happy just to let life take you where it leads you, without a plan? I must say that having a plan for my family was the biggest driving force that I could have applied to help grow my business. Because it gave me focus on what I needed my business to do for me to help me to reach those personal goals. Some people see what their business can do and then decide to do what they can with what the business produces. That’s like riding a donkey backwards. You never know where you’re going to end up until you get there, and often it is the wrong destination. Sometimes you don’t ever depart and sometimes you end up going backwards. Sounds like some dumb plan to me…. Once you know what you want your life to look like it’s then time to see whether your business has the ability to produce the income to achieve those outcomes. You need to change what you do in your business so that it produces better for you. You need to improve the skills of the people in your business. You need to change the people in your business. You need to change your business location or your business customers. You need to change the industry you are in and do business in a different business. There’s no point whinging and whining that your business and your lifestyle are at odds with each other when there are so many variables that you can tweak to change and improve the relationship. But how do I improve my business? Learn to be a better marketer of what you do than a doer of what you do. And that marketing is internal marketing as well as external marketing. The public assumes that as a dentist you are good at what you do, otherwise you wouldn’t be allowed to do what you do. Your customers will come to you because of who you are and how you treat them and how your business is run and how your business treats them ahead of how well stained and characterized your posterior composites and porcelains are. And when you market your business make sure your whole team is on board. There’s no point in change and improvement if there’s a weak point in your organisation. Everyone needs to be pulling in the same direction. Understand that nobody is going to run your business the same way that you are going to run your business. If you fail to plan then you plan to fail. Once you decide on what you want, you can achieve it. Are You Making It Personal? I was reading an article last week written by my good friend Shep Hyken. Shep Hyken is a customer service expert, and a New York Times and Wall Street Journal best-selling author. In this article, Shep was describing how way back when, when he learned about marketing, there were the Four P’s. And now, according to Shep, there’s a fifth P.
Personalisation is the process of humanising the experience, of interacting during the transaction in a manner that gets down to more than simply being the transactional exchange of a good or a service for a financial amount. Personalisation raises the importance of the relationship and the friendship that the customer and the business and the employees of that business all have with each other that transcends way beyond the financial transaction. We want our customers and patients to be visiting our dental office because of how well we relate to them, and how welcome they feel at our office, rather than simply because of the dentistry that we do. We want our relationships with our clients to be above and beyond the “commodity” of dentistry. Our relationship must always be built around creating an experience for our clients and patients. I was talking with one of my international dental clients today about the transformation that she and her office have made over the last nine months that we’ve been working together. She’s been able to transform her dental office from a Medicaid reliant practice to a fee for service dental office where patients that come now value their appointments and respect their health and keep their appointments and take personal responsibility for their oral health. My client has accepted that there is no need to try to be something to everybody, especially to those who do not value their oral health, when there are plenty of clients out there who do value their mouths and their treatment, but have been prevented from receiving that treatment and level of care because the privileged have obstructed them. She’s been overwhelmed at how grateful and respectful her paying clients are now that she is able to offer them much more of an experience and more of her time. And how willing these patients are to be paying her fees. And it’s all about providing a personalised experience. Can you do it in your office? And it is being done. My client’s team are so grateful to be now delivering a better type of experience to a more appreciative clientele.